The What: PreSonus' SL-Dante-SPK upgrade option card for StudioLive AI-series Active Integration loudspeakers is now available. 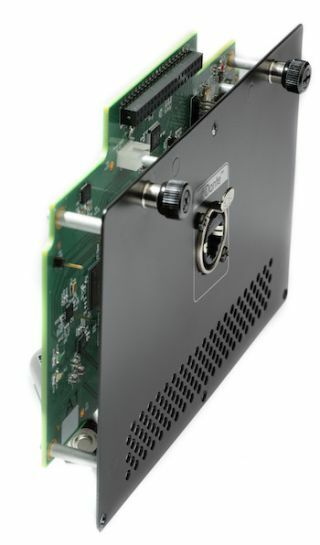 The SL-Dante-SPK card houses one Ethercon connection for Dante audio networking and remote control via the free SL Room Control application for StudioLive AI-series loudspeakers. The What Else: Dante-enabled StudioLive AI-series three-way active loudspeakers allow users to create a complete, networked audio system with any Dante-enabled mixer, using a standard 1 GB Ethernet switch and Audinate's Dante digital-media networking technology, which offers no-hassle, self-configuring, plug-and-play digital audio networking. Users can also connect non-Dante mixers, such as a first-generation StudioLive, to the analog inputs of a Dante-equipped AI loudspeaker and then broadcast the signal over the Dante network using CAT-5 cables. This makes Dante-enabled StudioLive AI a suitable solution for large FOH systems. The Bottom Line: The Dante upgrade works with StudioLive 312AI, 315AI, 328AI, and 328i loudspeakers and the StudioLive 18sAI subwoofer. It is available from PreSonus dealers and from the StudioLive AI Loudspeaker Accessories store, with an expected MAP/street price of $199.